Value-at-risk is a statistical method that quantifies the risk level associated with a portfolio. The VaR measures the maximum amount of loss over a specified time horizon and at a given confidence level. Backtesting measures the accuracy of the VaR calculations. Using VaR methods, the loss forecast is calculated and then compared to the actual losses at the end of the next day. The degree of difference between the predicted and actual losses indicates whether the VaR model is underestimating or overestimating the risk. As such, backtesting looks retrospectively at data and helps to assess the VaR model. 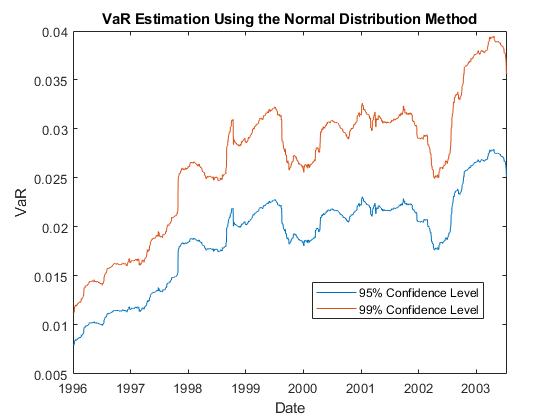 The three estimation methods used in this example estimate the VaR at 95% and 99% confidence levels. Load the data. The data used in this example is from a time series of returns on the S&P index from 1993 through 2003. Define the estimation window as 250 trading days. The test window starts on the first day in 1996 and runs through the end of the sample. For a VaR confidence level of 95% and 99%, set the complement of the VaR level. These values mean that there is at most a 5% and 1% probability, respectively, that the loss incurred will be greater than the maximum threshold (that is, greater than the VaR). For the normal distribution method, assume that the profit and loss of the portfolio is normally distributed. Using this assumption, compute the VaR by multiplying the z-score, at each confidence level by the standard deviation of the returns. 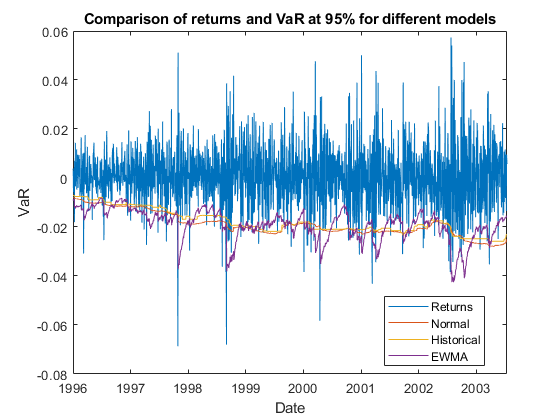 Because VaR backtesting looks retrospectively at data, the VaR "today" is computed based on values of the returns in the last N = 250 days leading to, but not including, "today." The normal distribution method is also known as parametric VaR because its estimation involves computing a parameter for the standard deviation of the returns. The advantage of the normal distribution method is its simplicity. However, the weakness of the normal distribution method is the assumption that returns are normally distributed. Another name for the normal distribution method is the variance-covariance approach. Unlike the normal distribution method, the historical simulation (HS) is a nonparametric method. It does not assume a particular distribution of the asset returns. Historical simulation forecasts risk by assuming that past profits and losses can be used as the distribution of profits and losses for the next period of returns. The VaR "today" is computed as the p th-quantile of the last N returns prior to "today." The preceding figure shows that the historical simulation curve has a piecewise constant profile. The reason for this is that quantiles do not change for several days until extreme events occur. 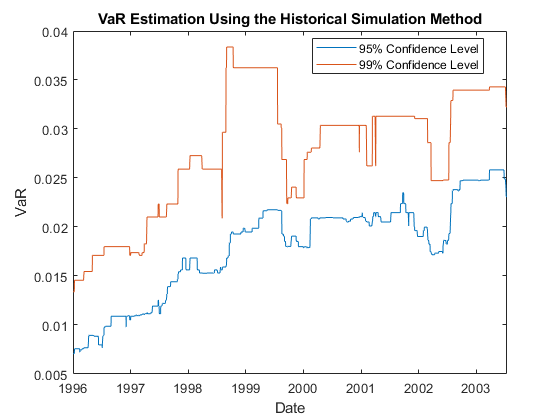 Thus, the historical simulation method is slow to react to changes in volatility. A value of the decay factor frequently used in practice is 0.94. This is the value used in this example. For more information, see References. 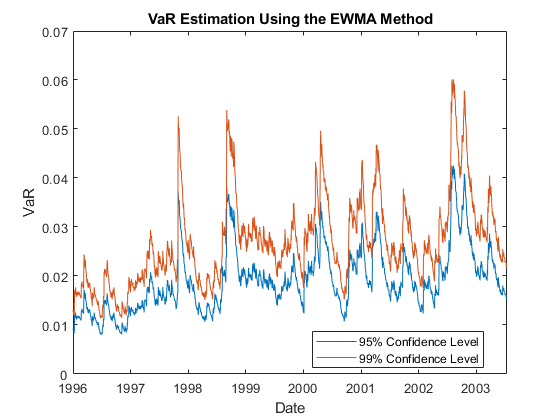 Initiate the EWMA using a warm-up phase to set up the standard deviation. Use the EWMA in the test window to estimate the VaR. In the preceding figure, the EWMA reacts very quickly to periods of large (or small) returns. In the first part of this example, VaR was estimated over the test window with three different methods and at two different VaR confidence levels. The goal of VaR backtesting is to evaluate the performance of VaR models. A VaR estimate at 95% confidence is violated only about 5% of the time, and VaR failures do not cluster. Clustering of VaR failures indicates the lack of independence across time because the VaR models are slow to react to changing market conditions. A common first step in VaR backtesting analysis is to plot the returns and the VaR estimates together. Plot all three methods at the 95% confidence level and compare them to the returns. A VaR failure or violation happens when the returns have a negative VaR. A closer look around August 27 to August 31 shows a significant dip in the returns. On the dates starting from August 27 onward, the EWMA follows the trend of the returns closely and more accurately. 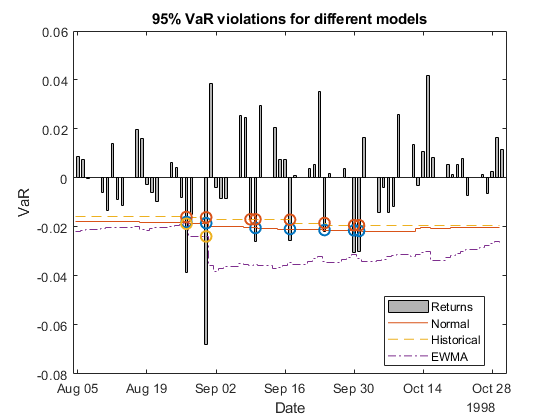 Consequently, EWMA has fewer VaR violations (two (2) violations, yellow diamonds) compared to the Normal Distribution approach (seven (7) violations, blue stars) or the Historical Simulation method (eight (8) violations, red squares). Besides visual tools, you can use statistical tests for VaR backtesting. In Risk Management Toolbox™, a varbacktest object supports multiple statistical tests for VaR backtesting analysis. In this example, start by comparing the different test results for the normal distribution approach at the 95% and 99% VaR levels. The summary report shows that the observed level is close enough to the defined VaR level. The 95% and 99% VaR levels have at most (1-VaR_level) x N expected failures, where N is the number of observations. The failure ratio shows that the Normal95 VaR level is within range, whereas the Normal99 VaR Level is imprecise and under-forecasts the risk. To run all tests supported in varbacktest, use runtests. The 95% VaR passes the frequency tests, such as traffic light, binomial and proportion of failures tests (tl, bin, and pof columns). The 99% VaR does not pass these same tests, as indicated by the yellow and reject results. Both confidence levels got rejected in the conditional coverage independence, and time between failures independence (cci and tbfi columns). This result suggests that the VaR violations are not independent, and there are probably periods with multiple failures in a short span. Also, one failure may make it more likely that other failures will follow in subsequent days. For more information on the tests methodologies and the interpretation of results, see varbacktest and the individual tests. Using a varbacktest object, run the same tests on the portfolio for the three approaches at both VaR confidence levels. The results are similar to the previous results, and at the 95% level, the frequency results are generally acceptable. However, the frequency results at the 99% level are generally rejections. Regarding independence, most tests pass the conditional coverage independence test (cci), which tests for independence on consecutive days. Notice that all tests fail the time between failures independence test (tbfi), which takes into account the times between all failures. This result suggests that all methods have issues with the independence assumption. To better understand how these results change given market conditions, look at the years 2000 and 2002 for the 95% VaR confidence level. For the year 2000, all three methods pass all the tests. However, for the year 2002, the test results are mostly rejections for all methods. The EWMA method seems to perform better in 2002, yet all methods fail the independence tests. To get more insight into the independence tests, look into the conditional coverage independence (cci) and the time between failures independence (tbfi) test details for the year 2002. To access the test details for all tests, run the individual test functions. From the N00, N10, N01, N11 columns in the test results, the value of p 01 is at around 5% for the three methods, yet the values of p 11 are above 20%. Because there is evidence that a failure is followed by another failure much more frequently than 5% of the time, this CCI test fails. In the time between failures independence test, look at the minimum, maximum, and quartiles of the distribution of times between failures, in the columns TBFMin, TBFQ1, TBFQ2, TBFQ3, TBFMax. For a VaR level of 95%, you expect an average time between failures of 20 days, or one failure every 20 days. However, the median of the time between failures for the year 2002 ranges between 5 and 7.5 for the three methods. 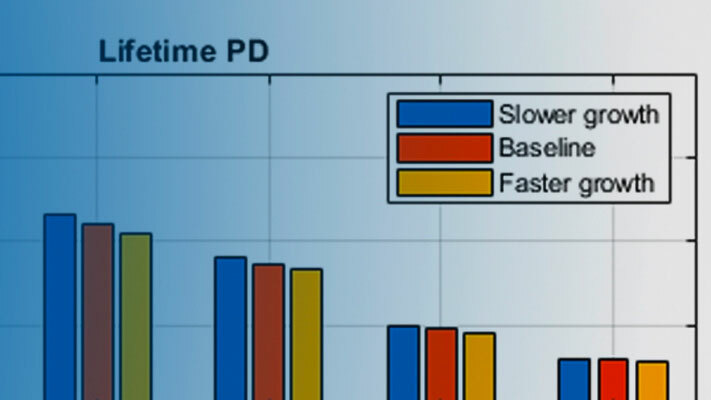 This result suggests that half of the time, two consecutive failures occur within 5 to 7 days, much more frequently than the 20 expected days. Consequently, more test failures occur. For the normal method, the first quartile is 1, meaning that 25% of the failures occur on consecutive days. Nieppola, O. Backtesting Value-at-Risk Models. Helsinki School of Economics. 2009. Danielsson, J. Financial Risk Forecasting: The Theory and Practice of Forecasting Market Risk, with Implementation in R and MATLAB®. Wiley Finance, 2012.